Detoxing your body from the effects of smoking cigarettes can be assisted by what you eat and drink every day. To get the most out of this type of detox, begin by quitting cigarettes outright. The recovery process is a gradual one, with your body returning to full health over a period of years. Making some changes to your diet and lifestyle assists in making recovery as smooth and quick as possible. The very first step of detoxing your body of the chemicals and nicotine from cigarettes is to stop smoking. You can use nicotine patches or gum if you want to do it gradually, or you can go "cold turkey" and do it immediately. Either way, you are likely to have cravings, particularly if smoking was paired with another habit (say, having your morning coffee, or when you had alcohol). Finding something else to do with your hands, or buying an e-cigarette, can help get you over this hurdle. According to the American Cancer Society, the detox and recovery process after quitting smoking starts after you finish your last cigarette. Within 24 hours, your heart rate and blood pressure drop, and in the next one to three weeks, lung function and circulation improve. A year on, your lung function is back to normal, and your risk of heart disease has halved. Five years out from quitting, your risk of developing most cancers or having a stroke has dropped dramatically; and 15 years on your risk of heart disease will be that of a nonsmoker. Drinking plenty of water will help hydrate your body, and start to flush out the toxins and chemicals that have built up in your cells. Depending on how long you smoked, this can take a while. However, drinking more water will help you feel more alert and energetic — which is very important if you've been relying on cigarettes for the energy kick. Aim to drink six to 12 cups of water per day, adding lemon or lime juice if you want some extra flavor. Eating fibrous green vegetables is an important feature of a detox diet. The members of the cruciferous vegetable family are high in glucosinolates, which are vitamins and mineral compounds that appear to reduce the development of cancerous cells. These vegetables are easy to get at your local supermarket, and you should eat about five cups per day. Good choices include broccoli, Brussels sprouts, cabbage, cauliflower, collard greens, kale, radishes, spinach and turnips. Exercising frequently will also help detox your body of the damaging chemical load from cigarettes. Exercise improves circulation, cell regeneration and the release of toxins from the body. Your body excretes chemicals in your sweat, and drinking water after a workout provides your cells with clean, chemical-free water. As you start exercising more you'll begin to regain the lung capacity you lost while smoking. 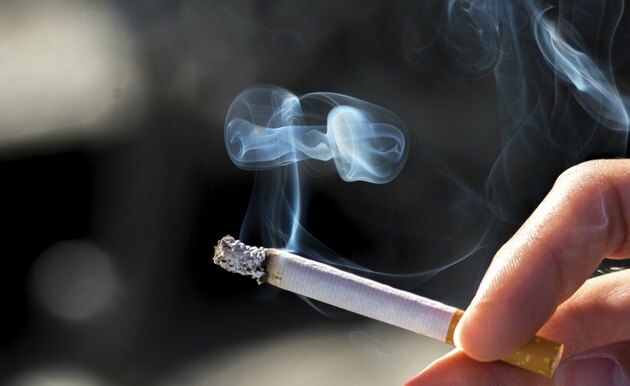 American Cancer Society: When Smokers Quit — What Are The Benefits Over Time? Authority Nutrition: Optimal Water Intake – How Much Water Should You Drink Per Day?